If you have a big-enough dog (20–120 lbs. ), you can mount the GoPro camera on him to get the canine version of a bird’s-eye view. You have a few ways to mount the camera, with the best using the GoPro Fetch mount, which is designed specifically for your four-legged pal. Of course, fitting a small chest harness to the dog seems to work well too. It may take a few adjustments to get the harness to fit snugly (and for the dog to get used to it, but that’s nothing a few treats can’t fix). 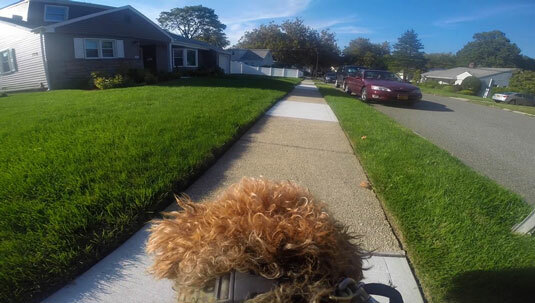 Dog’s-eye view — well, sort of! When the camera is mounted and on, just let your dog do his thing. The camera is lightweight, and if you mount it properly, it shouldn’t cause the dog any discomfort. Also, mount your GoPro to a toy or stick with the handlebar mount for a new perspective of your dog playing or performing tricks. Try to shoot at a frame rate of 60 frames per second (fps) to compensate for the constant motion. Control the camera with Remo or Smart remote seeing as though you can’t press the shutter on a moving dog. Get a dog’s view of the dog park. Watching your dog interact with his canine buddies puts you right in the middle of the action. Play fetch. The time-honored game takes on new, exciting meaning when you see exactly what the dog sees. Take your dog for a swim. If your dog likes the water, the GoPro is ready for the challenge, providing some interesting footage. When you’re done with the shoot, have a treat ready!